Hey all, sorry I’ve been so quiet lately. I’ve been dealing with computer problems and limited Internet access. But I did hear from Paul tonight, so I wanted to make sure his message got out to all of you in time. 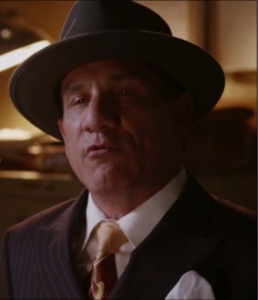 Paul wanted to let you know that he will be appearing in TNT’s Mob City tomorrow night, Wednesday, December 18! So check the listings in your area and set your DVR to record at 9:00 p.m./8:00 p.m. Central. I don’t know the name of the character Paul is playing, but based on the picture and the name of the show, I’d venture to say he plays a mobster. Ya think? So check out Paul tomorrow in Mob City and show your support for this wonderful actor! And feel free to leave a comment below for Paul. I’ll be sending him the link to this post. I’m sure he’d love to hear from you! This entry was posted in Blog, Paul Ben-Victor, TV and tagged Mob City, Paul Ben-Victor, TV Shows by Amanda Rogers. Bookmark the permalink. Hi, I?ve been recently a lurker all around your blog for some months. I love this article plus your entire web site! Looking forward to studying more! | My brother recommended I might like this website.| He was totally right.| This post truly made my day.| You can not imagine simply how much time I had spent for this information! Thanks!